There has never been so much corporate data outside of the data center as there is today. The data dispersion is due to the changing landscape of endpoint device usage, particularly in bring-your-own-device (BYOD) environments along with the rising mobility of the enterprise workforce. 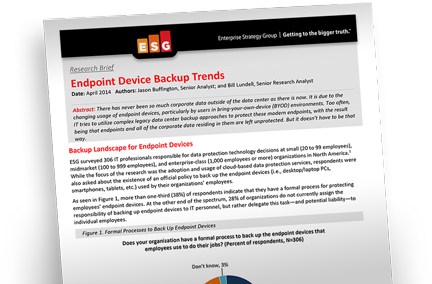 Learn the latest research on endpoint backup trends from two ESG senior analysts who conducted in-depth interviews with 306 IT professionals responsible for technology decisions.